Hand bags, purses and accessories. Louis Vuitton, Gucci, Cartier etc. Creme and navy blue Damier Azur coated canvas Louis Vuitton Hampstead PM with brass hardware, tan vachetta leather trim, dual flat shoulder straps, logo placard at front, creme Alcantara lining, three pockets at interior wall; one with zip closure and clasp closure at top. Estate Price $1530.00 CAD. Stock #e11729. Crafted out of brown beige GG supreme coated canvas, brown leather trim, and gold-tone hardware. Inner unlined. Please note on pictures the pull tab is broken. The broken pull tab is included. Estate price $970.00 CAD. Stock #e11711. Brown and tan Damier Ebene coated canvas Louis Vuitton Naviglio messenger bag with brass hardware, walnut leather trim, single adjustable flat shoulder strap, three interior compartments; one with zip closure, terracotta woven lining, single slip pocket at interior wall and dual snap closures at top. Estate Price $1240.00 CAD. Stock #e11730. 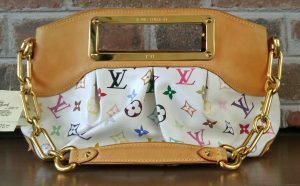 Brown and tan monogram coated canvas Louis Vuitton Musette Tango bag with brass hardware, tan vachetta leather trim, single flat shoulder strap, marigold Alcantara lining, single pocket at interior wall and magnetic snap closure at front flap. Estate price $970.00 CAD. Stock #e11716. 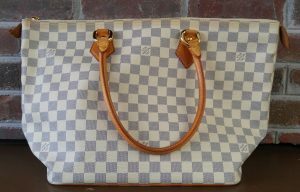 Brown and tan monogram coated canvas Louis Vuitton Mini Speedy with brass hardware, tan vachetta leather trim, dual rolled top handles, brown canvas lining and zip closure at top. Estate price $700.00 CAD. Stock #e11728. Brown and tan monogram coated canvas Louis Vuitton Blois bag with brass hardware, tan vachetta leather trim, flat shoulder strap, exterior pocket at front, brown leather lining, single slit pocket at interior wall and zip closure at top. Estate price $970.00 CAD. Stock #e11713. Creme and navy Damier Azur coated canvas Louis Vuitton Saleya MM with brass hardware, tan vachetta leather trim, dual rolled top handles, beige Alcantara lining, dual pockets at interior wall and zip closure at top. Estate price $1,385.00 CAD. Stock #e11709. 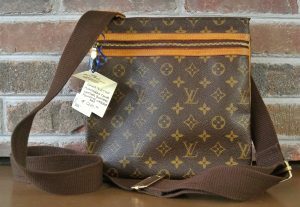 Brown and tan monogram coated canvas Louis Vuitton Delightful PM with brass hardware, tan vachetta leather trim throughout, single embossed flat shoulder strap, brown and tan striped canvas lining, single zip pocket at interior wall and clasp closure at top. Estate price $1510.00. Stock #eE11738. Brown and tan monogram coated canvas Louis Vuitton Amazon bag with brass hardware, tan vachetta leather trim, flat shoulder strap, exterior zip pocket, brown leather lining and zip closure at top. Estate price $1115.00 CAD. Stock #e11715. 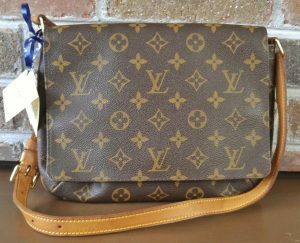 Brown and tan monogram coated canvas Louis Vuitton Pochette Bosphore bag with brass hardware, tan vachetta leather accents, flat adjustable canvas shoulder strap, zip pocket at front exterior, brown canvas interior lining and zip closure at top. Estate price $1,240.00 CAD. Stock #e11712. Blue Epi leather Louis Vuitton Speedy 35 with brass hardware, dual rolled top handles, single pocket at side exterior, tonal woven lining, single pocket at interior wall and zip closure at top. Estate price $1215.00 CAD. Stock #e11710. Brown and tan monogram coated canvas Louis Vuitton Boulogne 30 with brass hardware, tan vachetta leather accents throughout, single flat shoulder strap with buckle adjustment and shoulder guard, brown coated canvas interior lining, single pocket at interior wall with zip closure and zip closure at top. Estate price $1115.00 CAD. Stock #e11717. Brown and tan monogram coated canvas Louis Vuitton Danube bag with brass hardware, tan vachetta leather accents, flat shoulder strap, front exterior slit pocket, brown Taiga leather lining, single open pocket at interior wall and zip closure at top. Estate price $970.00 CAD. Stock #e11714.